Jim and his grandchildren have been experimenting with a wide range of Plastimake projects and techniques. New uses continue to arise. We have a "Dragon's blood" tree in our courtyard, its sap dissolved in alcohol was used as a varnish for old violins. Guess what? it also tints Plastimake to a life-like flesh tone if used sparingly. We've already seen a wide range of pigments used successfully with Plastimake, but Dragon's Blood sap has to be one of the most innovative pigments yet! 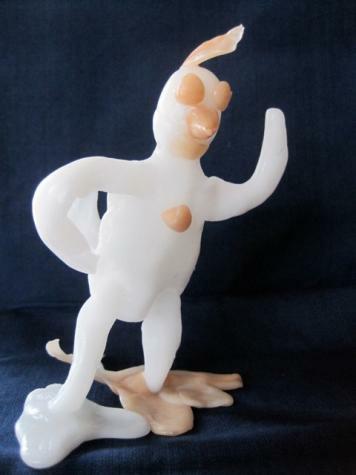 Today's example, titled "Chicken Boy", was created by Jim's talented 10-year-old granddaughter and features Dragon's Blood tinted feet, beak and comb.